What wine pairs best with beautiful scenery, vibrant fall colors, and seafood? Nova Scotia vintners would be delighted to help you choose. Located on Canada’s east coast, the province of Nova Scotia is a tourist’s delight. Coastal vistas abound with crashing surf from the Atlantic Ocean on the east and southern coasts, the fifty foot high tides in the Bay of Fundy on the western shore and the warm sheltered beaches of the Northumberland Strait to the north. Countless scenic fishing villages bring in catches of lobster, scallops, mackerel, herring and haddock. Sports fishermen cast their lines for tuna and shark, tour boats follow the movements of whales, leatherback turtles and dolphins. Coastal winds fill the sails of boats ranging from dinghies to three masted schooners. Nova Scotia is never more beautiful than in the fall when the days are cool, the nights are crisp and the woods ablaze with the changing colors of the leaves; lemon yellows, brilliant orange, iridescent pinks and deep scarlet, interspersed with tall dark evergreens and set off by the deep blue of water and sky. Traditionally, tourists have headed for Cabot Trail through the wooded highlands of Cape Breton Island for the fall colors, but in recent years the Fall Wine Festival in the fertile Annapolis Valley in Nova Scotia’s heartland has been a popular alternate destination with ten wineries within an hour and a half drive from Halifax. Over 100 cruise ships from all the major cruise lines as well as the smaller exclusive lines like Seabourn, Pearl, and the World visit Halifax harbor in September and October for the fall colors and the shore excursions for wine touring are heavily subscribed. There are six other wineries scattered around the province’s coastline. The oldest, Jost Vineyard is in Malagash on the Northumberland Strait, a natural stopping point for visitors driving from New Brunswick. 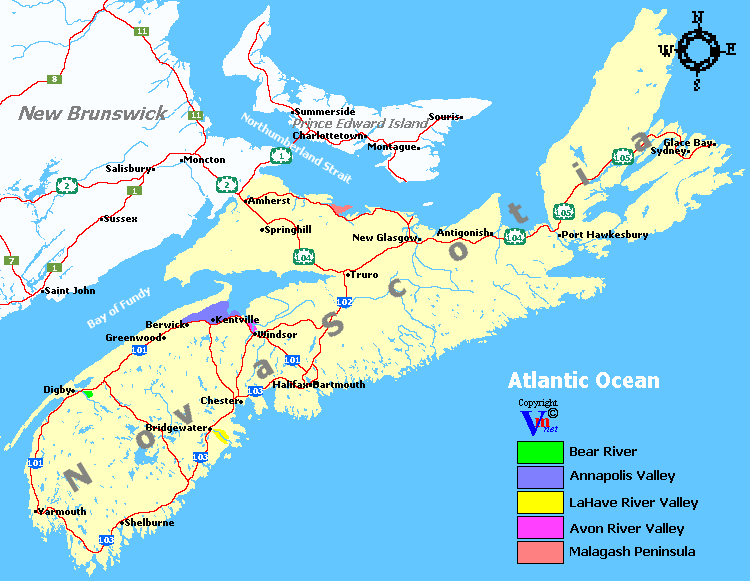 Annapolis Highlands and Bear River Winery are not far from Digby where the Princess of Acadia ‎ car ferry from Saint John, NB, docks daily having given passengers a view of Fundy tides and a bit of serendipitous whale watching in the crossing. Travelers arriving by Nova Star Cruises from Portland, Maine to Yarmouth, NS had casino or spa time with fine dining on the 10 hour cruise and can enjoy stopping at Petite Riviere Winery in the LaHave river valley, as well as Lunenburg County Winery and Muwin Estate Winery as they drive the coastal Lighthouse Route to Halifax. Like the fall colors themselves, Nova Scotias’s wines are shaped by its climate. They excel in aromatic whites with a crisp acidity and off-dry fruit forward rosés. Because of its short growing season, early June to mid September, the vines are largely hybrid to survive the long cold winter.. The whites include Vidal, Seyval, Geisenheim, Muscat, Ortega, and Traminette. One very versatile hybrid, l’Acadie, which takes its name from Nova Scotia’s early Acadian settlement, is described as Nova Scotia’s Chardonnay. There are some small plantings of European vinifera but they are susceptible to winterkill. The bulk of Nova Scotia reds are also hybrid including Lucie Kuhlman, Leon Millot, Mareechal Foch, Castel and Baco Noir. Nova Scotia’s winemakers have learned to make the most out of these grapes that best suit their growing season and wine tourists and wine critics genuinely rave about the quality of the wines. In 2011, Nova Scotia developed its own appellation wine called Tidal Bay, an aromatic white blend designed to pair well with local seafood. Each winery makes a slightly different Tidal Bay and wine lovers often collect them all for comparative tasting. Another specialty of the region is exceptionally fine ice wine. Predominately made from Vidal grapes, they are sometimes blended with Muscat or Ortega to add more complexity to the taste. Two wineries, Gaspereau Vineyard and Ste Famille also make maple wine. In the Annapolis Valley. wineries are also gaining a reputation for their fine Traditional Method sparkling wines. Both l’Acadie Vineyards and Benjamin Bridge have won international acclaim for their organic sparkling wines and several others including Blomidon Estates, Gaspereau Vineyards and Domain de Grand Pré have received national awards for their bubbly. For those who really want to discover Nova Scotia wines, Wolfville in the heart of the Annapolis Valley is the place to stay and explore. Accommodation choices include the spacious Old Orchard Inn and Spa with its hotel and chalet options. The beautiful historic Blomidon Inn has gourmet dining facilities and the largest private wine cellar in the province. There are numerous Country Inns and B & B’s with lovely names and reputations like The Tatingstone Inn, The Gingerbread House Inn, Victoria’s Historic Inn to name a few. Calling itself The Wine Capital of Nova Scotia, Wolfville provides the Magic Winery Bus, a low cost hop-on hop-off double decker bus service every hour to the wineries on its outskirts, giving tourists a chance to sample and savor without the necessity of driving. Four wineries are currently on the tour. Domaine de Grand Pré is owned by the Stutz family who emigrated from Switzerland in 1990’s to build and operate this beautiful destination winery. Patriarch Hanspeter has been a driving force in the Nova Scotia wine industry, his son, Jurg, is the European trained winemaker, and daughter, Beatrice, manages Le Caveau named one of the top 40 winery restaurants in the world by Wine Access Magazine. Wine Access also had high praise for Gaspereau Vineyards a small boutique winery in the nearby Gaspereau Valley which rated it #16 in the top 20 wineries of Canada. Gaspereau Vineyard is owned by Devonian Coast Wineries which also owns Jost Vineyard in Malagash and will be opening Mercator Vineyards (formerly Muir Murray Estates) also near Wolfville next year. Bruce Ewert, the owner / winemaker at l’Acadie vineyards, specializes in traditional method sparkling wines and has mentored other NS winemakers in the process. L’Acadie was the first certified organic winery in Nova Scotia. Among his trophies is a silver medal from l’Effervescence du Monde in France for his Prestige Brut 2007. Luckett Vineyard is the fourth stop on the tour, another destination winery with beautiful grounds and a patio restaurant. It is owned by Pete Luckett, from Nottingham UK, who single-handedly taught Nova Scotians to love their veggies with his signature stores, Pete’s Frootique, in Bedford and Halifax. The wines are great and the wine shop is an epicurean delight. To take a virtual tour of these wineries on the Wolfville wine Magic Winery bus, click here. Benjamin Bridge is a very prestigious organic winery on the outskirts of Wolfville. The late Raphael Brisbois, an international Champagne expert helped set up their traditional method sparkling wine program. Benjamin Bridge is open to the public by appointment only. Four other wineries are within a fifteen minute drive of Wolfville but too far away for the Winery Bus to include in their schedule. Blomidon Estates Winery near Canning, Planters Ridge in Port Williams, Avondale Sky in New Port and Sainte Famille in Falmouth. All are well worth the visit and have the awards to prove it. Two local wine tour companies Grape Escapes Nova Scotia and Uncork Nova Scotia offer a variety of wine tour day trips to customers in Halifax, Windsor and Wolfville. Uncork Nova Scotia is famous for its progressive dinners with Chef Kerina Dykstra providing each course of a dinner at four different wineries. Visitors just passing through Halifax can sample a wide selection of Nova Scotia wines at Obladee Wine Bar on Barrington, or several of downtown restaurants like Elements on Hollis, in the Westin Nova Scotian hotel and Chives Bistro on Barrington, who include pairings of local and international wines with all their menu options. For a list of the Nova Scotia Fall Wine Festival events click here.